Many of us put on slippers daily, especially in colder weather. Something we wear so often should be special. The Amore wool slippers from Italy are a toasty, artisan addition to at-home attire. 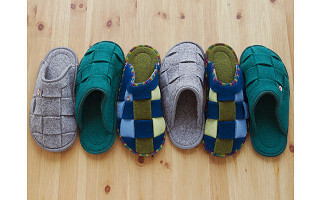 The design is inspired by the simplicity of the Bauhaus movement, where “form reflects and enhances function.” Made from a single material, these 100% felted wool slippers are eco-friendly and machine-washable on cold. (Make sure to air dry.) The over-under woven design looks great on both men and women, and it’s soft, durable, and lightweight. The open back keeps feet from getting too hot and makes the slippers easy to slide into. StepsControl strips on the soles offer extra grip and traction for climbing stairs or walking on slippery floors. Each right slipper is finished with a signature pearl button. It’s a lovely hand touch that is more beautiful and practical than a scratchy tag. 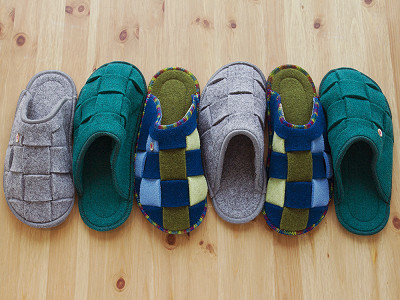 Treat your feet (or someone else’s) and let your cozy wool slippers deal with the cold floor. Hi everyone! I'm Mike from The Grommet, filling in for Renudo today. Let me know if you have any questions! These Amore slippers are aptly named because our entire office loved them. Why should everyone else feel the same way? We think there is a lot to love. The design is simplistic but fashionable for men and women. The wool is eco-friendly, lightweight, and durable with natural insulation to keep your feet warm. There is impact fabric for extreme comfort as well as StepsControl material on the bottom to keep you from slipping. We have been in business for 100 years so we think have created a slipper people will truly love, but you really can't know until you put them on. Do these slipper have any arch support? Thanks! Hi Karen, thanks for the question. There is no arch support, but there is some support with the impact fabric. I am interested in buying these slippers for my husband for Christmas. He wears a 10 1/2 shoe. The range of sizes for the X Large is quite wide. Would the slippers stay on his feet or would he keep slipping out of them? @Joan Hi Joan, We just had someone in the office who wears a size 10 1/2 try on the slippers and they were comfortable with the XL. These are one of our favorite holiday gifts! Marcia, thanks for the prompt reply. I will go ahead and order him the slippers. Hi Andrew, it serves as a reminder of where these fantastic slippers are made. And it replaces an annoying, itchy tag to keep your feet in a state of complete, heavenly comfort! I have a wide foot tripple EEE with will thwy fit me. If yes I wil buy? Hi Richard, thanks for the question! Because of the woven fabric, there is a little bit of elasticity which should make it good to go. If you find they don't fit, you can check out our return policy here. Just a question... do they come in any shade of purple... my girlfriend loves purple and I want to get her a pair for Christmas. Hi Jack, not at the moment, but if we get them in that color, we will be sure to let you know! Keep any eye out for updates, Lynne! Hi Loretta, if we get them, we'll be sure to let you know of the update! I, too, am concerned about the width...especially in the XL. Can you address this somehow? They look quite wide. Hi Wen, they are a little wider, but not much. There is a little bit of flexibility with the fabric to stretch with wider feet. As I responded to your comment below, you should fit in them as they come out of the box. I have an A-B width...men's 10.5. Now I'm concerned that they will be too wide if a EEE will fit. Hi Wen, it is no guarantee it will fit the EEE width, but because of the fabric there is a good chance it can. You should have no trouble as you will not need to test the elasticity of the fabric! @Mike I think maybe you misread Wen's question. I, too, am wondering about the fit for more narrow widths (A-B). How is the fit for a man's narrower foot? These will fit narrow feet right out of the box, but for those with wider feet, you can hold onto hope of a fit because the fabric has a little bit of flexibility. Hi. Do these slippers come in any other colors? I'm looking for brown or black. Thanks! Hi Ruth, the colors you see here are all that we are carrying at this time, but if there are any updates, we will be sure to let you know! I have a friend with size 12 really, really, really wide feet. is there any way these could be made to fit him? Hi Marci, thanks for the question. With our current offering, the XL might be able to fit him as the woven fabric has some flexibility with width. If they don't fit, you can check out our return policy here. I have extremely narrow feet in a woman's size 7-1/2 or 8. Is this a problem? Hi Mary, it shouldn't be. You would fit a medium comfortably. As for your question below, having flat feet should also not be a problem. The impact fabric at the bottom will provide you extra comfort! Forgot to mention I am also flat-footed. Problem? Very interested in these slippers for me. what kind of sole do they have? I have travertine floors which can be slippery if there is no type of traction on the bottom of the shoe. Hi Sandy, you are in luck! There is a StepControl stick material on the bottom to prevnt you from slipping! @Mike I'm not sure what that is (StepControl).... Can you post a photo of the sole of this slipper? Also, are these suitable for indoor/outdoor wear, like running out to get the newspaper? Hi Lynne, if you click on any one of the photos beneath the video you can see a picture of the sole. It is a thin strip of non-skid material for grip. And yes, you could use them for walking outside. The wool is very durable. You might want to use caution with extreme weather conditions though. These look fantastic! I am between an 8.5 and a 9. Best to order up or down? 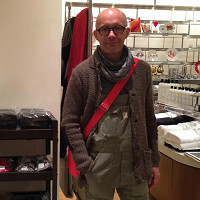 Thanks for an amazing, curated shop. Hi Michelle, they should fit true to size. And you can see a complete sizing guide by clicking on the product image below the video! These look so comfy! I was wondering if the sole is flexible or rigid. Thanks! Hi Tami, it's definitely more flexible that rigid! @Mike Thank you, exactly what I was looking for. Thanks for the quick response! Because of bone and fat lose in my feet I need LOTS of thickness between my feet and the floor. Most slippers get squished down quickly and it hurts to walk in them. How supportive are the insoles? Hi Jo, Renudo Slippers feature a lightweight, impact absorbent fabric to reduce stress on your feet so it is designed to help the problem you describe. If you find they don't work to what you need, you can check out our entire return policy here. Hi Jo, to be even more clear, Renudo Slippers were not designed for foot support. The impact absorbent fabric is a complementary feature, but not the focal point. They are on cold, gentle wash, Robin. And be sure to air dry! Wool normally makes me itch. Would these slippers do the same? Hi Terri, unfortunately, that is a very difficult question for me to answer. They are made of 100% wool so I would lean toward yes, but you never know until you try. If they do, you can find our entire return policy here. I clicked on photo beneath video but cannot find sizing guide~~~thank you! @Mike Hi. Can you make larger sizes. I wear a size 14 shoe? These look great. Hi William, I'm sure as Renudo continues to grow, they will look to expand sizes. If they do, we will be sure to update them on site. Stay tuned! Many of us put on slippers daily, especially in colder weather. Something we wear so often should be special. The Amore wool slippers from Italy are a toasty, artisan addition to at-home attire. The over-under woven design looks great on both men and women, and it’s soft, durable, and lightweight. The open back keeps feet from getting too hot and makes the slippers easy to slide into. StepsControl strips on the soles offer extra grip and traction for climbing stairs or walking on slippery floors. Each right slipper is finished with a signature pearl button. It’s a lovely hand touch that is more beautiful and practical than a scratchy tag.